The much awaited CAT Results 2013 is going to be announced on Tuesday, 14 January 2014 (tomorrow) at 9 am. 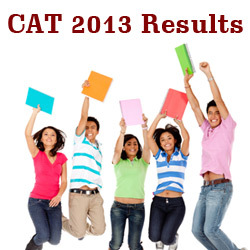 Candidates would be able to view their results either on the CAT’s official website: www.cat2013.iimidr.ac.in. They can access the results by using their username, password and roll number. The CAT Scorecard 2013 will be available between 14 January 2014 and 31 December 2014 at the CAT’s website for only those candidates who have appeared for CAT 2013. The CAT 2013 was conducted by IIM Indore over a 20-day period from 16 October to 11 November 2013, in which 1, 94,516 candidates appeared at 76 test centres across 40 cities. Conducted by Indian Institute of Management – Indore, the Common Admission Test (CAT) 2013 is the stepping stone for MBA aspirants to get admissions in IIMs and other top B-Schools in India for the academic year 2014. Along with all the 13 Indian Institutes of Management, several other leading institutes like Kirloskar Institute of Management, MICA Ahmedabad, Nirma Institute of Management, and S.P. Jain Institute, TAPAI allow admissions to various Management courses like MBA, PGDM, etc., based on CAT scores only. With 115 more seats being added in 2013 for B-School admissions, a total of 3335 seats are currently on offer in IIMs.